MD Dermatics Acne Fighter is the best acne and pimple spot treatment product in Singapore. 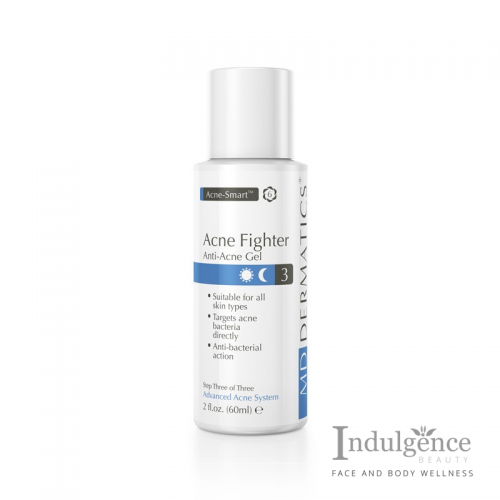 MD Dermatics Acne Fighter contains Benzoyl Peroxide and other potent acne combating ingredients to provide a focused approach to treating, controlling and preventing acne. 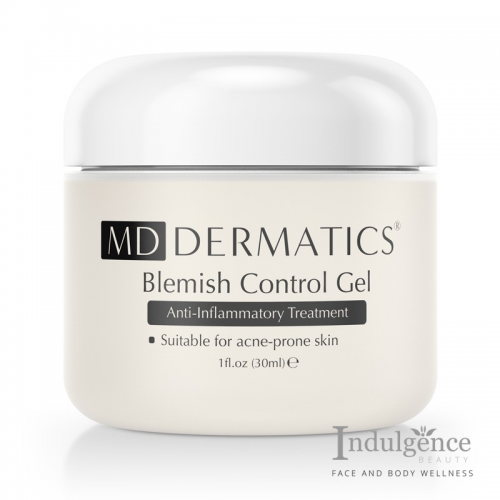 This highly efficient gel quickly clears acne and prevents new breakouts from occurring. Cellular activity is stimulated, and cell regeneration is increased. Acne is a skin condition commonly seen in Singapore and is caused by the over activity of the glands that secrete oily substances (sebum) on to the skin. When there is an increase of sebum, the area around the hair follicles gets clogged up and formed white heads and black heads. A bacterium, called Propionobacterium Acnes that normally lives on the skin thrives within the blocked pores ( white heads and black heads ). This infection causes inflammation of the skin, which is responsible for the redness and swelling of a spot resulting in acne. Begin with Signature Extraction Treatment Facial and Advanced Acne System to treat any existing acne infection. Acne Fighter contains Benzoyl Peroxide and other potent acne combating ingredients to provide a focused approach to treating, controlling and preventing acne. This highly efficient gel quickly clears acne and prevents new breakouts from occurring. Cellular activity is stimulated, and cell regeneration is increased. This ACNE FIGHTER is a miracle. Very powerful, almost instant results, Highly recommended for acne sufferers like me. Md dermatics acne fighter s a wonderful product for pimples. It dries them up quickly without overdrying unlike other products. Highly recommend this Acne Fighter to everyone, was recommended to me by my classmate. After using for a day or two, the acne is gone, is an awesome and amazing product. 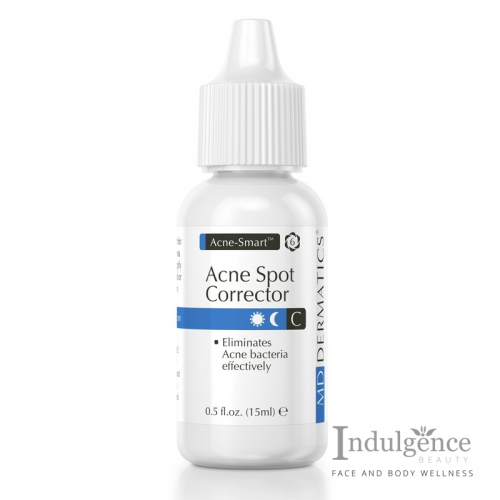 I have adult acne and I love this Acne Fighter because I can see results to my problems areas fast. Been using MD Dermatics Acne Fighter for a few days only and am seeing great improvement with my skin. I always get menses hormones related acne and MD Dermatics Acne Fighter helps clearing it all up fast. Much much better than any other acne products I’ve tried so far. I’m a CONVERT !! !, it is a fantastic acne treatment product. MD Dermatics Acne Fighter work wonders for my skin, easily reducing the appearance of my inflammation and redness spots overnight. It is a great product overall. i have occasional pimples especially before my period. Was recommended by my friend and i found that it is very effective on those pimple. It do reduce the inflammation and redness very fast and requires very little every time and it takes only a few application to clear the acne. I had used everything like Oxy, clean and clear, Clinic cream and nothing has worked so well for my skin! This is my first MD Dermatics acne fighter and I’m amazed and very pleased with the results I’m having now with 2 days of application. 3 Huge red acnes had reduced greatly and 2 are almost gone. My boyfriend had acne, had bought this Acne cream for him and it works very well for him. MD Dermatics Acne Fighter, finally a acne cream that works!!! Thank you Indulgence Beauty for the recommendation.